Houghton Mifflin Harcourt, 9780618251292, 352pp. 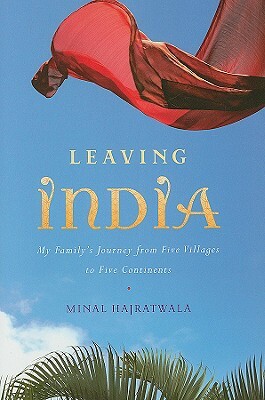 An inspiring personal saga that explores the collisions of choice and history that led one unforgettable family to become immigrants In this groundbreaking work,Minal Hajratwala mixes history,memoir, and reportage to explore the questions facing not only her own Indian family but that of every immigrant:Where did we come from?Why did we leave? What did we give up and gain in the process? Beginning with her great-grandfather Motiram’s original flight from British-occupied India to Fiji, where he rose from tailor to department store mogul,Hajratwala follows her ancestors across the twentieth century to explain how they came to be spread across five continents and nine countries. As she delves into the relationship between personal choice and the great historical forces—British colonialism, apartheid,Gandhi’s Salt March, and American immigration policy—that helped to shape her family’s experiences, Hajratwala brings to light for the very first time the story of the Indian diaspora. This luminous narrative by a child of immigrants offers a deeply intimate look at what it means to call more than one part of the world home. Leaving India should find its place alongside Michael Ondaatje’s Running in the Family and Daniel Mendelsohn’s The Lost: A Search for Six of Six Million. MINAL HAJRATWALA was born in San Francisco and raised in New Zealand and suburban Michigan. In the course of researching Leaving India, she spent seven years traveling the world and interviewed over seventy-five members of her extended family. A poet and performer, she worked as an editor and reporter for eight years at the San Jose Mercury News. She has been a leader in the National Lesbian and Gay Journalists Association and the Asian American Journalists Association.